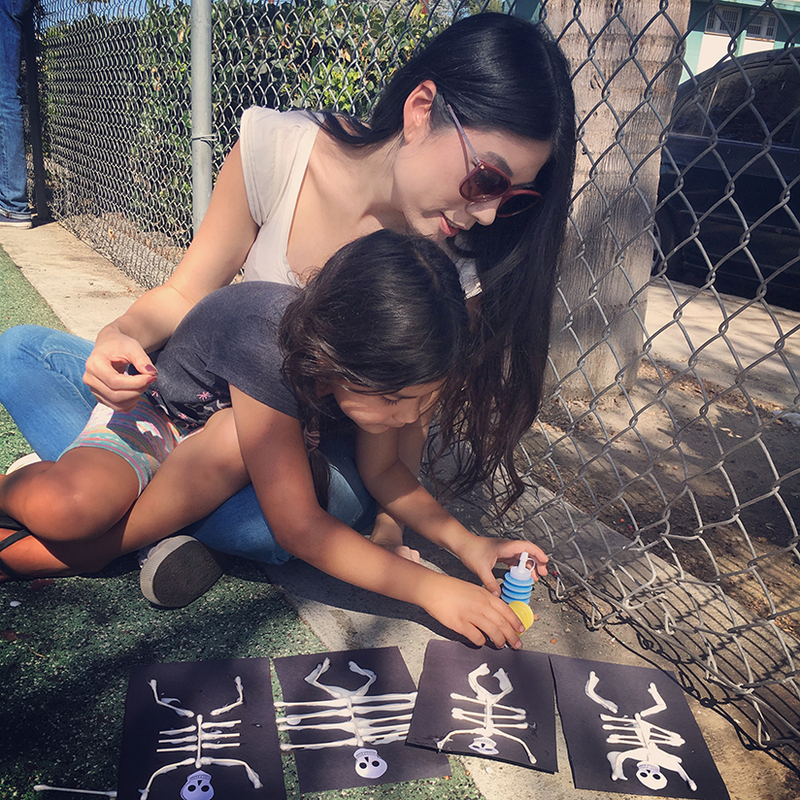 Flora Huang helps a young mentee decorate for Halloween. Photo courtesy of Flora Huang. The children who attend Red Eye’s Saturday mentoring sessions pose for a group picture. Photo courtesy of Flora Huang. A trip to the local convenience store is a weekly treat for Red Eye kids. Photo by Erin Sullivan for Red Eye. A young girl leaps through the air during a Red Eye mentoring session at the Watts Empowerment Center. Photo by Erin Sullivan for Red Eye. Flora Huang and first-time author Marveon in front of the new Watts Empowerment Center in February 2018. Photo courtesy of Flora Huang / Marveon Mabon. Flora and Kenayla at the new Watts Empowerment Center. Photo courtesy of Flora Huang / Red Eye. 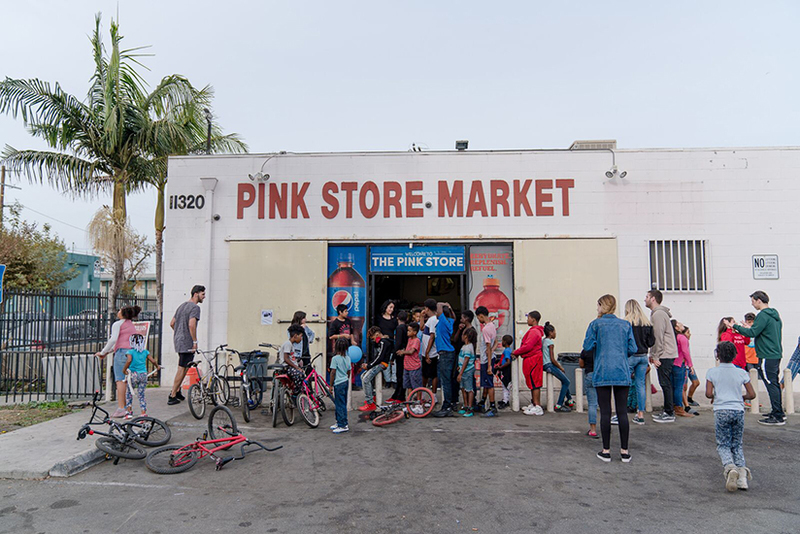 Watts is a Los Angeles neighborhood with a legacy of poverty, racial tension and violence. It’s notorious for the Watts Riots, a nightmarish five-day 1965 clash set off by police brutality and intensified by poor race relations. Today, residents of Watts’ low-income housing projects are still hindered by the city’s lack of interest in rehabilitating and modernizing their neighborhood. Children growing up in the area have more options to pick a gang than a college, and their tap water is potentially contaminated with lead or arsenic. 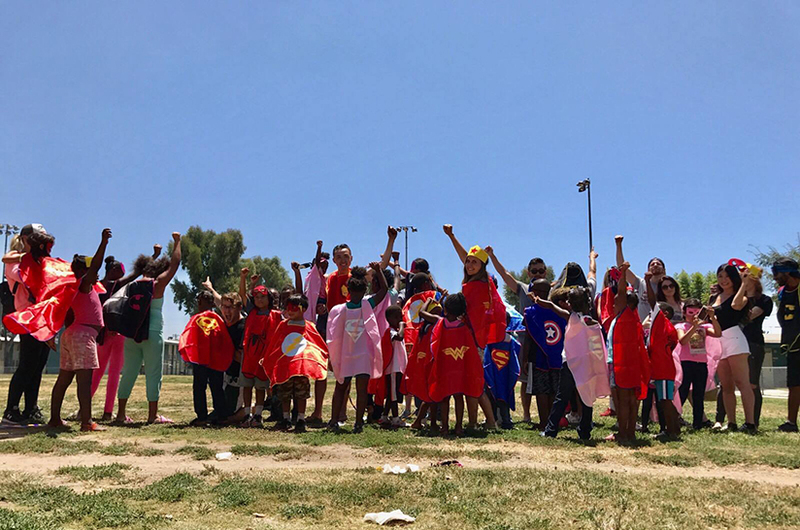 As a mentor, Huang spends her Saturdays with Red Eye at the Imperial Courts Housing Projects in Watts. Huang and her fellow volunteers talk to the kids and encourage creativity by working on art projects together – from drawing in coloring books to decorating pumpkins. Every Saturday, they take the kids to the local convenience store and let them choose a snack. It’s a small gesture, but it can be the highlight of their week. They celebrate birthdays with a trip to get frozen yogurt, a rare treat for these kids, and often the only thing they have to look forward to on their birthday. Huang may be part of the “up and in,” as an established professional working a high-level job in a career she adores. But her story is one of transformation, too. Huang is a first-generation American, whose parents emigrated to the U.S. from China. Growing up outside of Boston, Huang recalls watching American movies because her parents wanted her to absorb the natural inflection of “proper” American English (they only spoke Mandarin at home). Huang grew to love these movies, especially Audrey Hepburn films; Breakfast at Tiffany’s, Funny Face, Roman Holiday, and Sabrina – all distributed by Paramount Pictures – are among her favorites. She dreamed of someday working at the studio that produced these beloved films. “Not knowing a soul in the industry, or in California for that matter, it seemed an impossible dream,” said Huang. She took steps to make this dream attainable. Growing up, Huang kept a copy of The Movie Business Book on her bedroom bookshelf, in which she learned that Hollywood had roles for “numbers people” like her. She attended UCLA to make connections in Los Angeles and gain experience in the film industry. While studying business, Huang applied for internships at every major studio, and was hired to intern at Paramount’s Motion Picture Planning group. After graduation, she worked at accounting firm Deloitte & Touche and obtained her CPA, then set off for France to attend international business school at INSEAD. Ten years later, she returned to California with her MBA and once again applied for jobs at movie production studios. Paramount offered Huang the opportunity to come back in 2010, first working as a finance consultant. “It was a full-circle experience,” said Huang. As a mentor, she tells this story to empower the kids. Once, she was a young girl whose parents feared she would never have the skills necessary to succeed in American society. Watching movies in her childhood home, the star-studded, alpine logo of Paramount Pictures embedded in her mind, she made a choice: to take control of her destiny. “You can never dream too big,” is what Huang tells the kids. Some of Huang’s mentees have come to the center since they were toddlers. Marveon, a 14-year-old boy who has lived in the projects since he was a young boy, exemplifies this transformation. His short-term goal was to write a book. Volunteers provided motivation, encouragement and support, guiding Marveon through the process of writing the book. Imperial Guards, written by Marveon and five other kids from the projects, is Imperial Courts’ first student-author book. The 82-page book features characters that chase after their dreams despite facing obstacles and hardships in their lives; in other words, it embodies Red Eye’s mission. Thanks to the guidance he received from Red Eye, Marveon can share his success story and this message of empowerment with other children growing up in under-served communities. Huang has volunteered throughout her adult life, engaging in philanthropy via her sorority in college, and later volunteering in special events for the Motion Picture and Television Fund (MPTF). 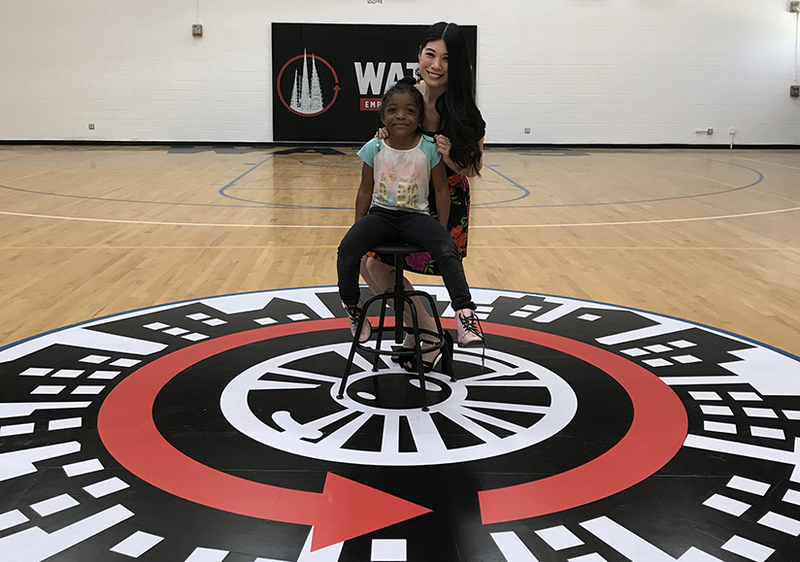 And though she initially started as a special events volunteer, she opted to become a weekly mentor, working with the organization at its most granular level. She’s never been more grateful. “Becoming a mentor filled a void in my life,” said Huang. As the recipient of one of this year’s two Viacommunity Awards, Huang will receive a grant of $10,000 to help Red Eye. She has already mapped out how to best utilize this money. “Government funding was recently cut from the Watts Community Center,” explained Huang. Red Eye is taking charge and creating “The Watts Empowerment Center,” which involves renovating and furnishing the building, implementing more structural programming, and hiring full-time staff. The goal is to turn a weekly mentorship program into a 24/7 retreat for kids looking to better themselves and start on the path to a successful future: whether this means learning a new skill, creating art, networking or simply avoiding the negative influences in their neighborhood. 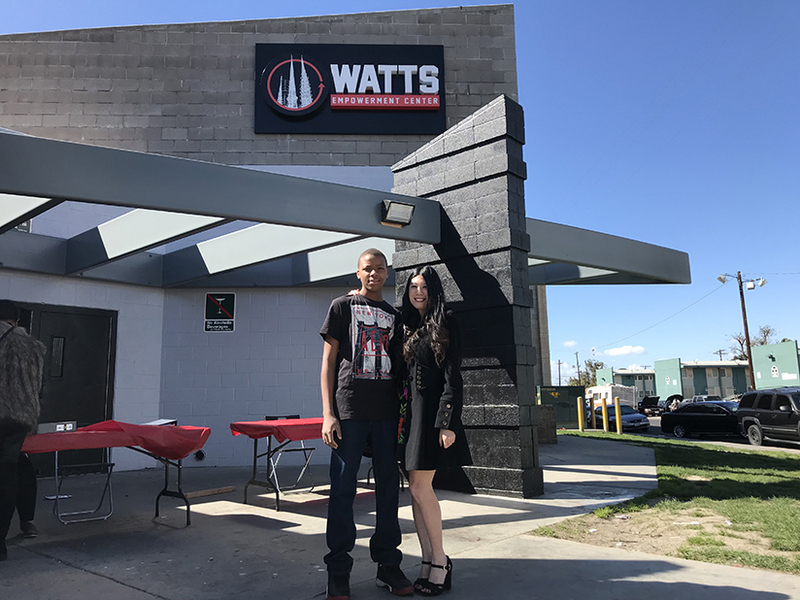 The Watts Empowerment Center opened its doors on February 19, 2018.